There is always a lot of chatter about the Magic Kingdom’s Wishes dessert party in the Tomorrowland Terrace area and rightly so. I have been and it was a terrific experience! This was a great idea by Disney and I enjoyed every moment of it. It made sense then when presented with the idea of trying Epcot’s version I jumped on it. So first we had a bit of a challenge finding it. Knowing Disney so well we thought oh we can figure out the logistics on our own and did not do what normal people do and get all the info before hand…do not do what I do people. We asked three different CM’s and got three different answers…so we went to the first place and it was not right in front of Canada. Then the next place it was not was the International Gateway area. The third place and CM we asked went well and we hit the jackpot! What did we win? Yummy desserts and a great view of Illuminations all for the small (in Disney Dollars) fee of $49.00 (adults) and $29 (children). So where is this hidden area? Well it is at the Port of Entry adjacent to Mexico so right in FRONT! Please CM’s if you are reading this do not haze the dessert party newbies by sending us on a wild goose chase! We finally arrive and get right to it because you do not want to waste a moment of fun. I notice right off that it is a lovely set up! There are smaller tables for people that have a hard time accessing the high bar tables. Then higher bar tables with tablecloths (cloth ones!) and pretty candles on each table for a little mood lighting. Tables were not assigned so first come, first served but there seemed to be a table for everyone. Do you notice how I keep saying table and not seating? Well, my number one main complaint and confusion is this…there are no seats. I will set the stage for you…long day of walking at Epcot, sun goes down, it is time to indulge in some sparkly drinks and sugar. Oh, yes for your $49 we could not get you a fold-out chair so you get to stand (or do what the majority did and that was to sprawl out uncomfortably on the concrete). I did ask a CM about this – as in “I assume this will get fixed soon”. His answer was not the best…basically saying they only allotted 30 minutes to set up for the dessert party and could not get the chairs out in time that way. I did not love the answer but what are you going to do? 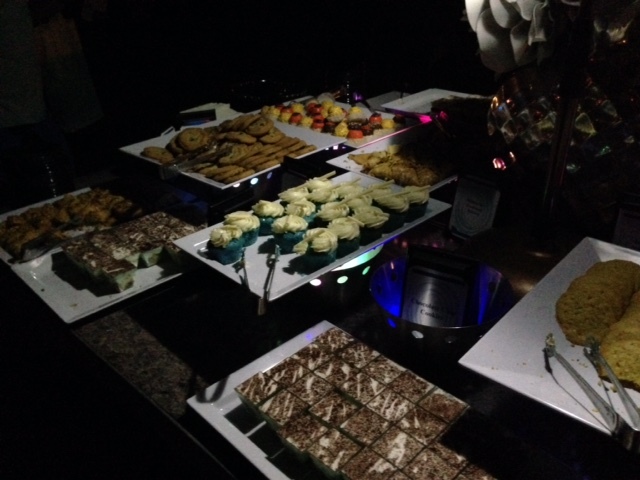 Okay enough Boo’s and Hisses and on to the best part – the delicacies and the sparkly! There were a few buffet type tables set up and one of the most interesting things is each dessert is a specialty from a different country. There were predictable countries and dessert pairings like Tiramisu from Italy and chocolate ganache tarts from France (now I am not saying the tarts were the typical French part but the chocolate!) But even the predictable were well done and amazing!The best and most amazing bites were some of the unpredictable such as the crisped rice puffs from Asia. These little morsels were on the top of my list. But do you know what ended up being not only my favorite but most everyone’s there? Seasonal berry cobbler from the good ol’ US of A. Who knew? I thought going in the blue cupcakes would win my heart but the berry cobbler was the best cobbler I have ever had and so well done. 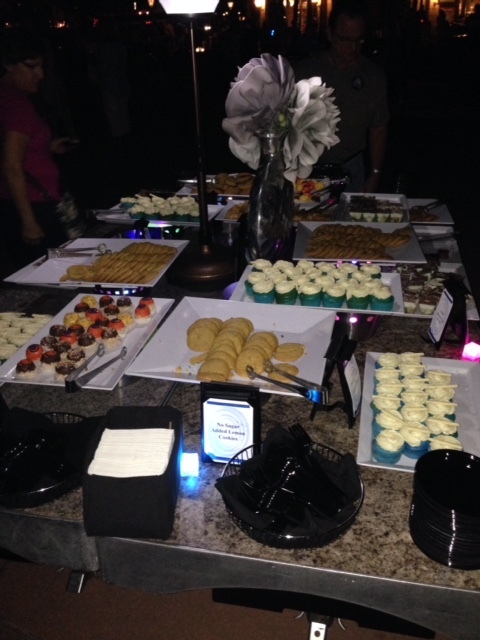 Truly a delicious treat but all the desserts were so well done and fun to see and eat. There was a lot of options and something for everyone and to see a full menu you need to go and see it and taste it all for yourself or check out more info by clicking HERE. If you are deciding between the Magic Kingdom and Epcot for your next dessert party it is fairly easy to break down. If you are going for the best desserts and atmosphere then Epcot wins hands down in my opinion. If you want better organization and a seat then head on over to the Magic Kingdom – it was just better organized and I liked having an assigned table and a chair plus there desserts were grand as well (they just need to borrow some cobbler and they will be all set!) Though for a date night at Disney the Epcot is so beautiful and romantic and you can rub each other’s feet later…okay do both! It is a tie! 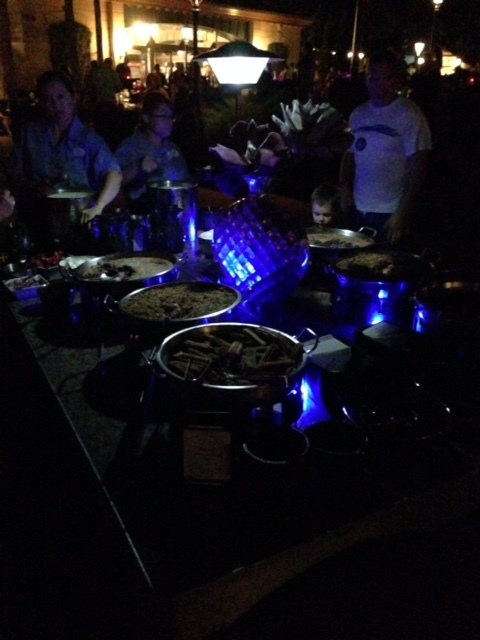 Have you done either (or both) of the dessert parties at Disney? What did you think? 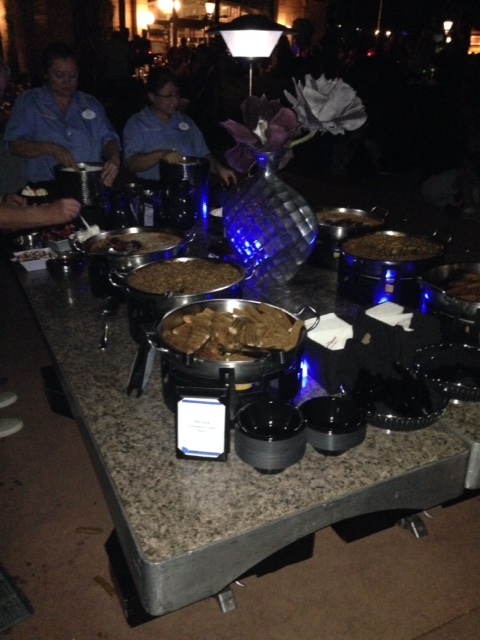 This entry was posted in Disney World and tagged Cobbler, Dessert, Epcot, illuminations, Romantic, Sparkly by Tara. Bookmark the permalink. What a great time! Sounds like a great value for all that you get as well as a great seat (or standing ha ha) location for Illuminations viewing!